Bike BSM Slushfest 2005 - Splash down! All traditions have to begin somewhere. 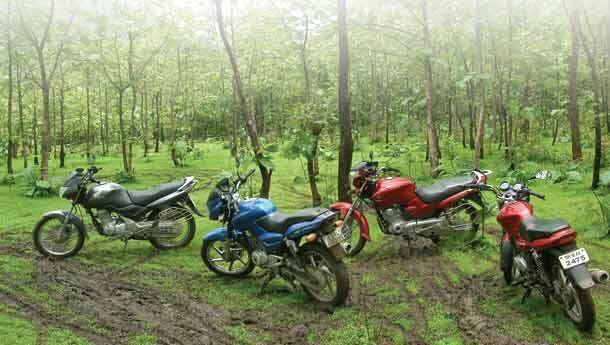 Having covered our cars and selves in mud to celebrate four-wheel drive and the monsoon, it was time for the bikes to join in the fun. So we instantly called up nobody and decided to go churn up some mud with our long termers. Good plan? Well, in hindsight, we should have been doing this for years! Obviously, I finagled into the saddle of the Pulsar 180, while Bijoy wielded his Honda Unicorn and Nandu was on the Discover to start with. Yes, poor Pablo, forever singing paeans to the comfort levels of his Fazer, got stuck with it. Once we got to our super-secret test location, we realised that instead of a continuous timed run, we’d have to split the tests into three separate sections due to geographical constraints. Since we were doing this for the first time, we decided to park the stop watch and just go with the seat of the pants. Next time, we plan to use even more sensitive testing equipment for even more muddled, er... clearer results. 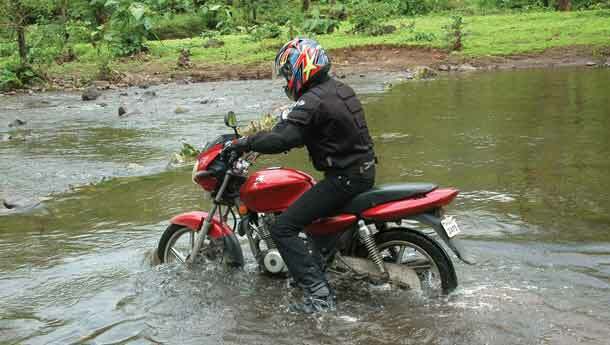 The first of the tests was a stream crossing, location to be decided by Bijoy. So our man slides right up to a place where the water’s at least twenty feet wide and thirty inches deep in the middle. Nice. Make no small plans, eh? To make the challenge tougher, one bank was rocky and the other one muddy. The best machine would combine the ability to find traction along with good ground clearance (rocks underneath) and if all else failed, the ability to stay afloat (self explanatory). The second test saw us riding a short trail with a rocky/muddy surface, moderate undergrowth and sections where thorny bushes, incoming trees and strategically placed stones and roots would make life difficult. The final test, and the most enjoyable one, was one of control. We were to draw circles (eventually lurid eights) around three (later two) trees, as quickly as possible. The grassy-muddy surface meant that traction was scarce, slides and wheelspin abundant. A foot down would cost you five seconds. However, as the fun, er... test progressed, it became harder and harder to control our laughter and the stopwatch was parked for good. The Yamaha Fazer is deeply committed to being a good urban, on-road commuter. And while comfort levels are excellent, it shares nothing with its distant cousin, the YZ125. The lack of bite from the engine creates problems in tough terrain, though it helps the bike manage scanty traction in slick mud. It was simply a question of which bike had more power in most of the tests. As a result, the Discover is the easy pick for third place. Its low stance made it easy to hold up in the flowing stream water, but also caused the exhaust pipe to touch down on submerged rocks now and then. Up the trail, the revvy 125cc motor proved to be quite handy, and combined well with the lithe motorcycle to get the Disco squelching through without undue drama. The racket it made was quite dramatic though, with some fauna spotted fleeing the scene in a hurry. The Disco’s shining moment was the grass circle challenge, where it wasn’t the quickest but able to put down the most lurid of the slides. At one point, Nandu had it revving hard in second, clutch out completely, spinning wildly at the rear. And still, the light weight made it easy to use body english to keep it pointed in the intended direction. The diminutive size also made it the least intimidating to ride.The missing headlight actually happened before the slushfest, when designer Sandeep tried to brake on a gravel patch and had to use the 407 he was following as a braking device. The Disco’s a laugh. It’s a bit low slung for the streams, but the way the engine’ll keep the rear wheel spinning in the slush is as funny as Ray Romano. However, we cannot see a real off-road version of this machine just yet. 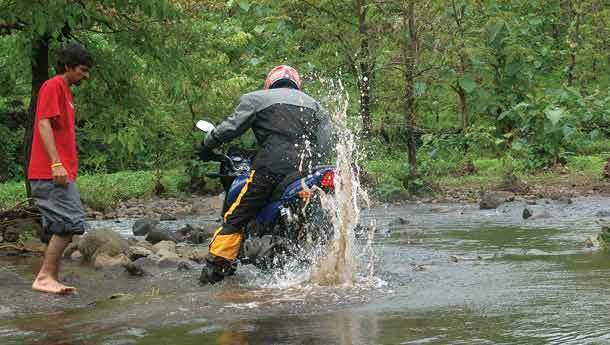 The Honda Unicorn was Bijoy’s favourite off-road machine, and indeed our man was the first to get his feet wet, entering the stream as soon as we said ‘ready.’ And from then on, it was steady and go. Bijoy did manage to take a bit of a detour and had to reverse mid-stream but the Unicorn didn’t seem to mind. The thin rear tyre did make it harder for the Honda to find traction, but that was about the only difficulty he faced. A wider rear tyre and cubes (now there’s a wide-spectrum antibiotic) would help the Unicorn really churn up the dirt. As is, the street ergos work off-pavement and the stiff monoshock comes in handy over the bigger bumps. The Pulsar 180 DTSi wins this contest, thanks to the extra power from the extra cubes. In the stream, I got stuck more than a few times having miscalculated the path of least resistance. Each time I had to paddle backwards to get the exhaust header clear of the rocks; then a quick hint of throttle would have the 180 leaping forward through the water. The steep muddy bank, where both the Fazer and the Disco struggled a bit, was easy with the 180 calmly spinning its way up on to the other side. Up the trail, the 180 showed its motor’s brawn as well, charging through on its 1.5 kgm of torque without any problem.Any deflections added by rocks and roots needed just a whiff more of throttle to disappear. However, my aching forearms did suggest that a wider, taller handlebar would probably have made it easier to ride in these conditions.The 180 was the bike that made the most circles around the trees. Big power, and a hair-trigger throttle came together into huge slides, bordering on the out-of-control. In more than one case, the 180 was still spinning wildly after completing the circle. Thanks to our previous experiments with the bike (we’d cut out the plastic mudflap at the back), it was the only bike that ended up with clods of mud on the pillion seat. The simple joys of big torque and horsepower are hard to ignore! While the Unicorn probably made it easier for the rider, two of four testers handed the number one plate to the 180. The Bajaj enjoys smashing smaller obstacles into smithereens, although street-spec clearances do mean it grinds down on rocks now and then. The shorty handlebar also raises effort, but at a very basic level, the 180’s a huge smile-inducer. Can’t wait to lay our hands on a full-on off-road variant of this... Anyone taking hints?